When FIFA expressed the need for a fully connected smartwatch to use at the 2018 FIFA World Cup, Hublot stepped forward and brought the idea to life with the The Hublot Big Bang Referee 2018 FIFA World Cup Russia™, limited to 2,018 pieces. Using their iconic Big Bang model as inspiration, Hublot designed their first ever smartwatch to become the official timepiece of the worlds most anticipated footballing event. Featuring the emblematic architecture cut out of light titanium and the bezel decorated with 6 H-shaped screws, synonymous with the Big Bang design. Released last month at Baselword with a whole host of football inspired events, Hublot has kicked off their World Cup campaign with the announcement of this limited edition timepiece. With the emerging trend of interchangeable straps coming out at SIHH and Baselworld 2018, the Big Bang Referee can be fully customised on match day to sport your country’s colours. With a series of fan dials in the colour of each participating nation, additional straps can also be purchased to match your outfit when cheering on your team. Prefer a more casual look when the football is finished? 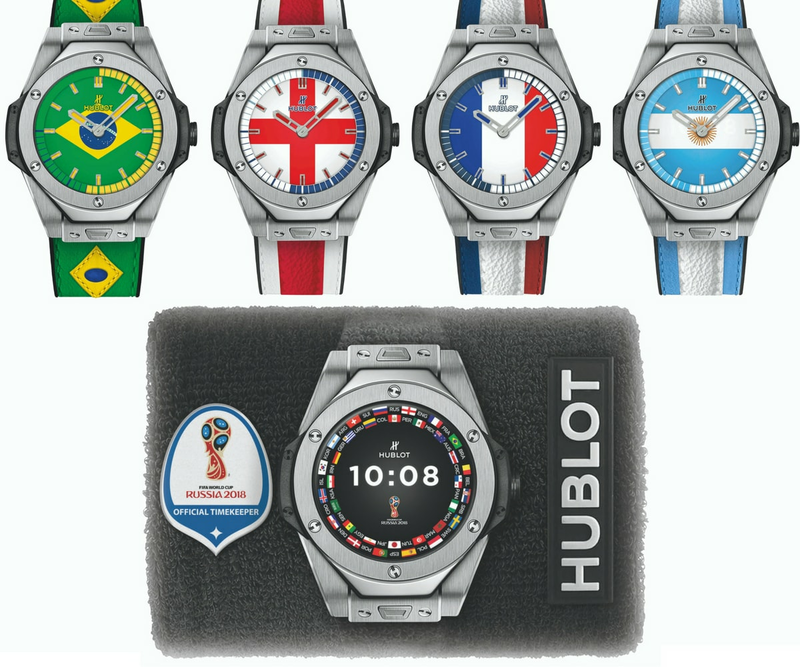 Use Hublots patented “One Click” interchangeable strap system to swap back to the cuff strap in sponge featuring the World Cup emblem, or a black lined natural rubber strap. With the swipe of a finger, display the analogue option that could pass for the same look as the classic automatic models. Within the 49mm case runs Google Wear OS technology that will keep you up to date with the top moments from every game. Displayed on the 35.4mm screen, the unique addition features several notification features including match announcements 15 minutes before kick off, notify the wearer of any yellow or red cards, substitutions as well as any goals scored. During the match, the dial will show full match statistics including goal scorers and match time. With the world cup just around the corner, now is the perfect time to register your interest to get your hands on this special piece of World Cup history. Visit Watches of Switzerland Online to register your interest, or call into your nearest Watches of Switzerland showroom.